More trails, less effort. The Cube Reaction Hybrid Pro 400 is an electric hardtail mountain bike that will help you rack up more singletrack miles. With a powerful Bosch Performance CX e bike motor to boost your natural pedalling power riding has never been easier. The 400Wh battery pack is neatly integrated into the frame. The Reaction Hybrid is available with either 27.5” or 29” wheels, depending on frame size. SIZES : 16", 18", 20", 22"
The Overvolt AM 800i comes equipped with the new Bosch Powertube 500 battery, which perfectly integrates into the frame a sophisticated lithium-ion technology combined with a compact and elegant aluminium design. Featuring the new E-MTB mode, the level of assistance is automatically adapted to optimise battery autonomy. Accessories have been carefully selected to satisfy all requirements inherent in an electrically-assisted mountain bike, like oversized tires offering the rider added skid resistance and comfort, associated with wheels dedicated to the Overvolt line, strengthened well beyond those of non-motorized models. Its Supreme 5 aluminium frame serves to keep weight low and enhance reliability, two keys to the success of this type of bike. PLEASE NOTE, THIS IS ONLY A GUIDE. The Lapierre eZesty AM LTD Ultimate is a the new Lapierre range with 150mm travel, a Fazua Evation motor, Fox 36 fork and NX Eagle drivetrain. The all new lightweight Fazua Motor! Smaller 250Wh battery and motor (3kg). Combined bike weight 18kg. LIMITED AVAILABILITY, PLEASE CONTACT US. The Cube Stereo Hybrid 160 Race 500 Full Suspension e-Bike is a ride-anything, enduro, Bosch e-bike that brilliantly blends exceptional handling and comfort. With quality components like a 170mm travel RockShox Yari fork and 160mm Fox Float DPS EVOL shock, a Sram NX Eagle 1x12 drivetrain, Magura MT Trail hydraulic brakes, a Newmen finishing kit and a dropper post, this is an incredibly capable e-bike that’s up for any challenge. The frame is constructed from High Performance 7005 Aluminium which has a very low density and high strength. This property combined with a triple butting process and hydroforming technology has enable them to make high performance frames with an ultimate level of stiffness. A specially formed down tube houses the semi-integrated battery in a very low and sleek position in the frame triangle. This generates an extremely low centre of gravity which promotes an agile riding characteristic and has the advantage of making the bottom bracket area super rigid. The frame features internal cable routing which as well as adding to the clean, sleek appearance also increases the durability of the cables by protecting them from dirt and the elements. To provide motor powered assistance Cube chose the renowned and incredibly rugged Bosch Performance CX drive unit paired with a Bosch PowerTube 500. The unit is incredibly user-friendly and is controlled through an easy to read handlebar mounted Bosch Purion device. As well as showing which of the assisted drive settings is selected, the display also provides current speed, ride time and battery life. For the Stereo Hybrid 160 Race 500 Cube selected a RockShox Yari fork with 170mm travel up front and Fox’s Float DPS EVOL shock with 160mm at the rear, both are high in performance and easily adjustable to optimize your ride. There’s also a slick-shifting Sram NX Eagle 1x12 speed drivetrain to help you find the right gear and powerful Magura MT Trail hydraulic disc brakes with 203mm rotors front and rear to keep things under control. Schwalbe Hans Dampf 2.6” tyres provide smooth rolling comfort and grip while a stunning Newmen finishing kit keeps you comfortably on track. For scope to check out steep lines in perfect control there’s also a dropper post. 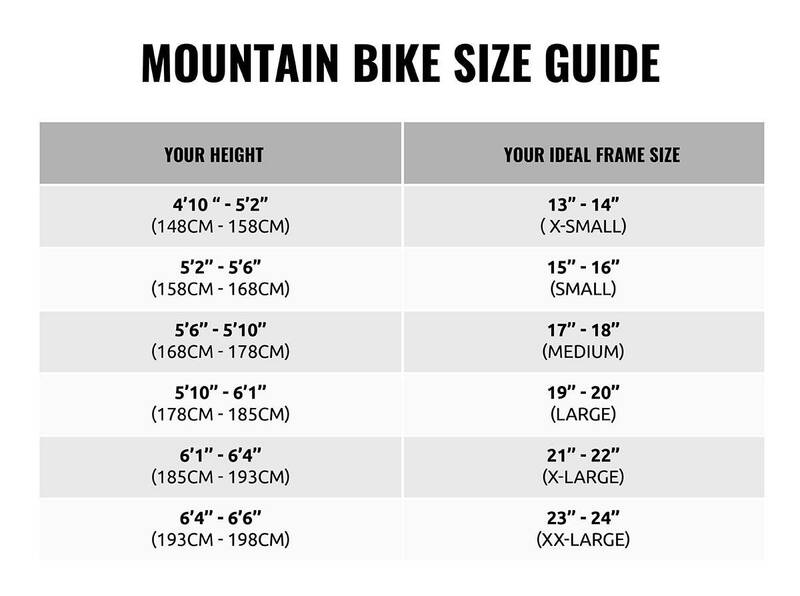 Size Chart - PLEASE NOTE - Sizing is subjective. The below chart is only a guide. 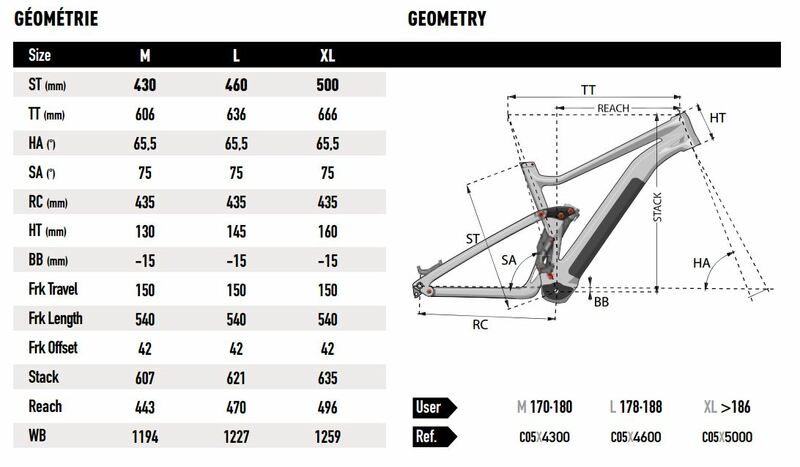 We recommend you visit the store and select the size and geometry that suits your riding.